Offset your flight and support certified climate protection projects here with your donation. For DHL's GoGreen program, atmosfair takes clean stoves to Lesotho. The stoves save money for valuable wood, stop deforestation and prevent continual smoke inhalation. 150 km north of Delhi: farmers take mustard crop residues to the atmosfair power plant. The green energy generates cash for them. Whether it is a flight, an event, business travel or just a certain amount of CO₂: calculate and offset your CO₂ online in just a few steps. It's safe, and you will receive a certificate. What does climate-friendly travel mean? Lack of information is often to blame when people do not travel in a climate-friendly way. This is a shame since climate-friendly travel is usually pretty simple. If you like to visit new destinations and travel using different modes of transportation, you will see that you don’t have to make huge concessions or invest a lot of extra effort in climate-friendly travel. Choose accommodations with energy-saving measures, eco-labels, etc. Most people on holiday wish to relax, slow down, have fun and find spiritual balance. It is possible to meet these needs without travelling great distances. Even a walk or a bike ride starting at your own front door can be a memorable experience. Biking and hiking are two of the most popular holiday activities in Germany. Most regions have recognised the potential to attract tourists by continually building and improving bike trails and hiking paths. You can find many travel offers in Germany on the Hiking Association website or in the bike travel database Fahrradreisen.de (both in German). Regional travel agencies can provide you with maps and other information about exciting tours and interesting destinations. If you are planning your holiday without a car, you should choose a region with a good public transportation system and book your accommodations with someone who is knowledgeable about transportation in the area or is a member of a local car-sharing organisation. This site labels such accommodations (information available in German). Regions that support tourists without cars can be found on the Alpine Pearls website, which includes information on communities in the Alps with good public transportation. Additionally, there are often great deals or guest cards available for buses and trains within cities or regions, such as the KONUS-Card in the Black Forest (information available in German). You can find an overview of ecological tourism destinations in the EU-supported sustainable tourism database, Destinet. The best eco-label accommodations in Germany can be found at verträglich-reisen.eu. Transportation emissions comparisons are measured in grams of CO2 emissions per passenger-kilometre. 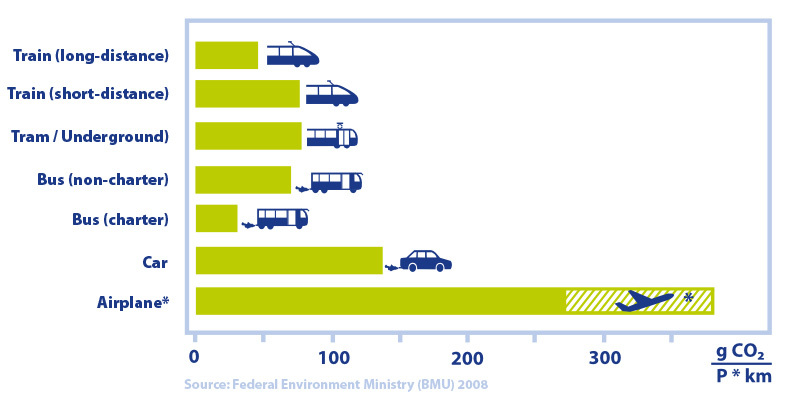 We have considered the average capacity of each vehicle as well as the effects that each one has on the climate. Trains that run on green electricity are more or less CO2-free. You can find travel stories, tips and information on buses, trains, ferries, and climate-friendly accommodations as well as explanations of eco-labels in tourism at Verträglich-Reisen.eu. Please consult the following German websites for travel services and tickets to any destination: Gleisnost.de, Kopfbahnhof, or via e-mail at bahnagentur.spindlersfeld@t-online.de. Enjoy the Mediterranean! Every year, millions of tourists travel to Majorca by plane on holiday. 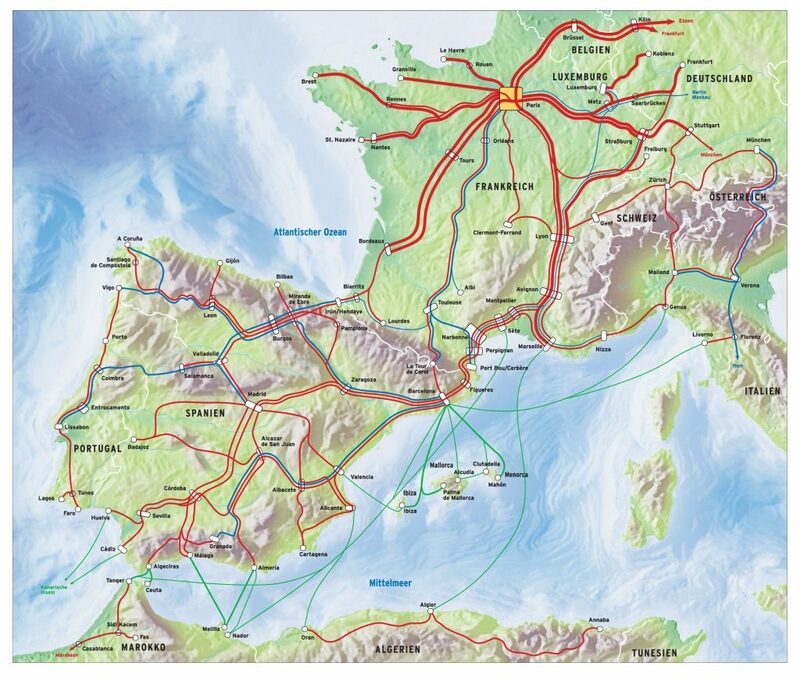 Few people know about climate-friendly travel to Majorca via train and ferry services from the Spanish mainland. From western and northern Germany, the best route is through Paris on the Thalys from Cologne or on the ICE or TGV from Frankfurt. 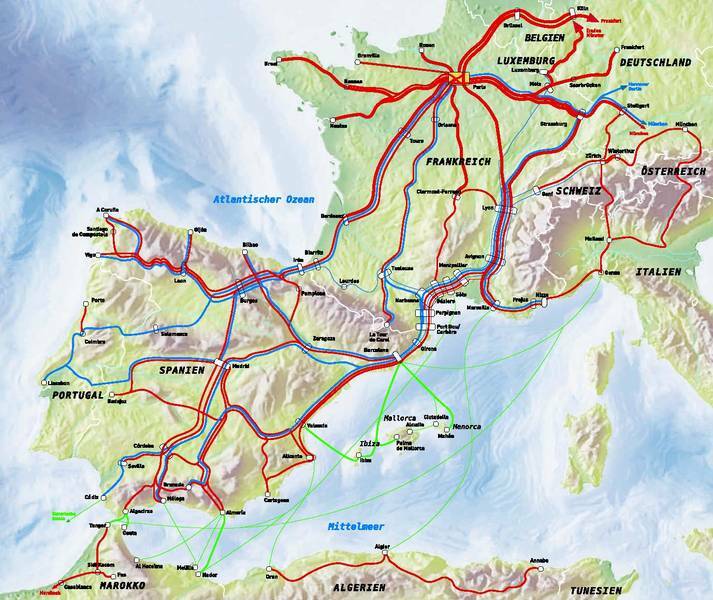 From Paris, the Elipsos night train brings you directly to Barcelona, where you can board a ferry to Majorca. From southern Germany, the easiest route to Barcelona is through Zurich, where you can board the Elipsos night train that takes you to Spain via the Alps and the beautiful Côte d’Azur.